Climate change will make coastal areas such as these more susceptible to extremes of weather and tide. Environment Minister Lord Henley today visited Blackpool to look at new and proposed flood defences and coastal protection aimed at guarding against future storm surges and rising sea levels as a result of climate change. Parts of the Fylde have previously been hit by flooding and climate change will make coastal areas such as these more susceptible to extremes of weather and tide. Lord Henley visited Anchorsholme, to the North of the town where an innovative new coastal protection scheme is being developed to protect 1,500 homes and businesses from flooding. He also viewed the newly built flood defences at North Pier. All of the new flood defences have been designed, not only to reduce the risk of flooding, but to regenerate the seafront areas of the town and creating more open space for use by visitors to one of Britain’s top tourist attractions. Blackpool’s flood defences project, led by the urban regeneration company ReBlackpool and the local council, are funded by Defra and the European Regional Development fund. The council have also worked closely with the Environment Agency in the design of the schemes. The Institute of Civil Engineers rated Blackpool’s flood defence scheme as one of the best in the UK. 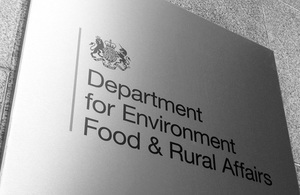 DEFRA contributed £67.5 million, which enabled additional funding of £8.2 million to be provided from the North West Regional Development Agency and £3 million from the European Regional Development Fund (ERDF). Innovative design has created 6 large headlands; each extending 30 metres, which offer unique tourism attractions and provide better access to the beach and promenade, along with the creation of a new summer promenade. These new headlands along the seafront will be used to create “a year round urban park” for Blackpool. In the past there have been breaches of the sea defences in the central seafront area due to a combination of high tides, high winds and high rainfall. The effects of climate change will make extreme weather events more common, reinforcing the need for the adaptive improvements to coastal defences such as those constructed on Blackpool seafront. The new seawall will continue to protect the central area of Blackpool from coastal erosion and flooding with a designed life of 100 years.